Some of Mary Lowry's evidence at the Tipperary murder trial has been described as the "most devious, devious poison" heard by the Central Criminal Court for many years. 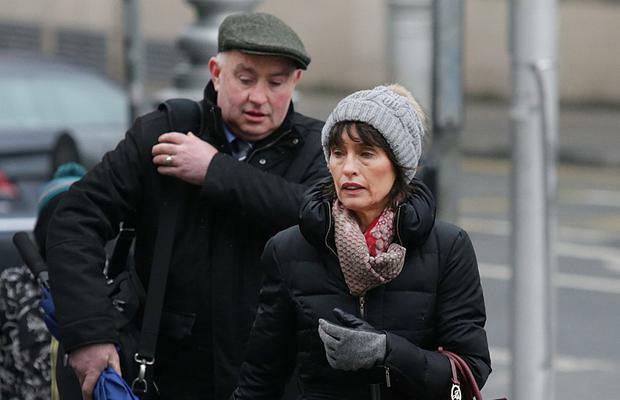 Defence counsel Bernard Condon SC made the claim after telling jurors the widow changed her account of seeing murder accused Patrick Quirke on the morning his alleged love rival Bobby Ryan went missing. Mr Ryan stayed the night of June 2, 2011 with his girlfriend Ms Lowry at her home in Fawnagown, Co Tipperary, but left before she got up to take her children to school. He was missing until his body was found 22 months later in an underground tank on her farm, which was being leased by Mr Quirke. The court was told Ms Lowry gave a statement to gardaí six days after the disappearance saying she saw Mr Quirke in the farmyard around 8.30am on the morning of the disappearance. At the time she said she believed he was doing some work early in the day as he was heading away with his family for the weekend. The defence barrister said that after the body was found, Ms Lowry "introduced" a new detail into her account, that Mr Quirke was "hot, sweaty and bothered looking" when she saw him that morning. Mr Condon said that in court, Ms Lowry suggested there was something odd about Mr Quirke being there at that time of the morning. He said this was an attempt to suggest Mr Quirke, her former lover, was up to no good. "This was a piece of the most devious, devious poison that has been delivered across the face of the Central Criminal Court for many a year," he said. Yesterday was the second day of Mr Condon's closing speech in the trial. Much of his address to jurors was focused on the evidence of Ms Lowry. The barrister claimed she was manipulative, told lies, put a spin on her evidence and attempted to rewrite history. Ms Lowry was "a person prepared not to tell the truth when it suits her", the barrister said. He claimed she was "able to bald faced sit here and say black is white". Mr Condon also attacked the prosecution case against his client, saying it was "a forensically barren wasteland". The prosecution alleges Mr Quirke murdered Mr Ryan so he could rekindle his affair with Ms Lowry. But Mr Condon told the jury of six men and six women it should not look at the quantity of the evidence, but the quality of it, and that a lot of the inferences they were being asked to draw had nothing to do with the murder. The defence barrister said there was uncertainty over the events of June 2 and 3, 2011. "When you have uncertainty over those events, then you have a difficulty," he said. Mr Condon said it was alleged Mr Ryan was murdered some time after leaving the house at 6.30am. He said the windows were open, yet neither Mary Lowry nor her mother-in-law Rita Lowry heard anything. The trial has heard Mr Quirke leased Ms Lowry's 60-acre farm and had an affair with Ms Lowry, which she described as "sordid" and "sleazy". However, she was in a relationship with Mr Ryan when he disappeared in June 2011. Mr Condon highlighted a number of aspects of Ms Lowry's evidence where he said she was "prepared to revise history". He said it was suggested Mr Quirke was not a good friend of Ms Lowry's late husband Martin Lowry. Mr Condon said all of the evidence would not support that suggestion. He also focussed on her evidence about a night away she and Mr Ryan spent in Bundoran, Co Donegal, just days before his disappearance. The trial heard she was annoyed when she found Mr Ryan dancing with another woman and that she "gave out" to him for five hours on the journey home. Mr Condon said that in fact what happened was that they broke up on the journey home. The trial heard they reconciled two day later. Mr Condon said Ms Lowry subsequently told gardaí Mr Ryan was dancing with a woman in Bundoran he met the night before. But when she was quizzed in the witness box, she said this was a woman Mr Ryan had known years before and they were just catching up on old times. Mr Condon also said Ms Lowry had invented a claim she asked Mr Ryan if it was OK for her to dance with another man on the same weekend away. Mr Condon said the jury had to be careful about placing undue weight on Ms Lowry's evidence. He said that while the visit to Bundoran was not of consequence to the case, what was of consequence for the jury was whether it could take her evidence as "gold standard". In her evidence, Ms Lowry said her relationship with Mr Quirke became a sexual one in January 2008. She claimed he "crossed the line", that she found him "overpowering" and that she was "very vulnerable at the time". But Mr Condon asked if this was just Ms Lowry talking in hindsight about a relationship she now regrets. He pointed to evidence given by her brother Eddie Quigley in which he told Mr Quirke: "Mary will make up her own mind and you and me won't change that." The barrister said this gave a different view of Ms Lowry to the naive and vulnerable person she portrayed herself as.